STRATEGIC AIR COMMAND had a pretty awesome logo. It was a shield featuring an iron-gloved hand clutching three lightening bolts and an olive branch, set against a blue sky with white clouds. Everything about it says "might." Nothing about it suggests "Welcome." Naturally, when my buddy Chris and I -- a couple of recently-certified college graduate geniuses -- happened across that symbol of American power affixed to a fieldstone wall near an entrance to the Vandenberg Air Force Base, we had to visit. It was a sunny July day in 1987. Turning off California's Highway 1 just north of Lompoc, we pulled up to the guardhouse. "Hi, we're here for the tour," one of us announced cheerfully to a uniformed guard. "Tour?" came the predicable response (predictable to anyone but me and Chris). "We don't have a tour." "Oh." Came the reply, "Can we just look around?" "No," the guard said. "But you can have this map." Oh clueless innocence. How does one react, 30 years later, to the dawning realization we'd been quickly sized up as rubes too naive to pose any sort of threat to national security? I guess it's better than being surrounded by armed MPs and taken into custody for questioning. 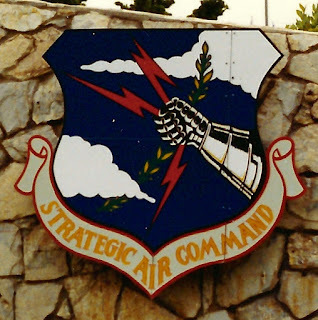 Strategic Air Command -- or SAC, for short -- was the U.S. Air Force Command responsible for maintaining the nation's nuclear-tipped intercontinental ballistic missiles and its strategic bomber fleet. Remember Atari's Missile Command? Remember that cute Matthew Broderick/Ally Sheedy movie WarGames? This was a combination of those things (minus the WOPR) but real. Global thermonuclear warfare. The only way to win was not to play. The very existence of SAC -- its effective deterrence -- made that strategy a winning one. Vandenberg AFB was a key element of SAC and of deterrence, and was used as a testing site for Thor, Atlas and Titan missies, the later two later doing double-duty as launch vehicles for NASA's Project Mercury solo orbital space flights and its two-man Gemini missions. 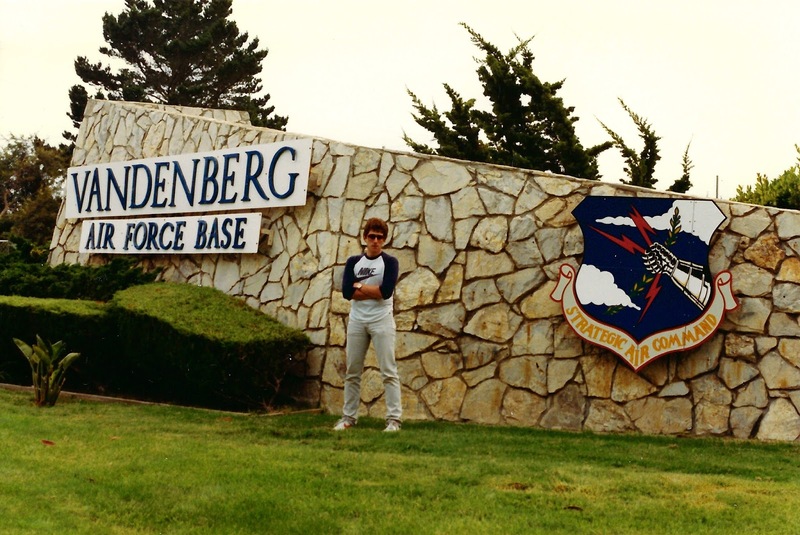 Vandenberg was also the proving ground for the Minute Man and Peace Keeper ICBMs. 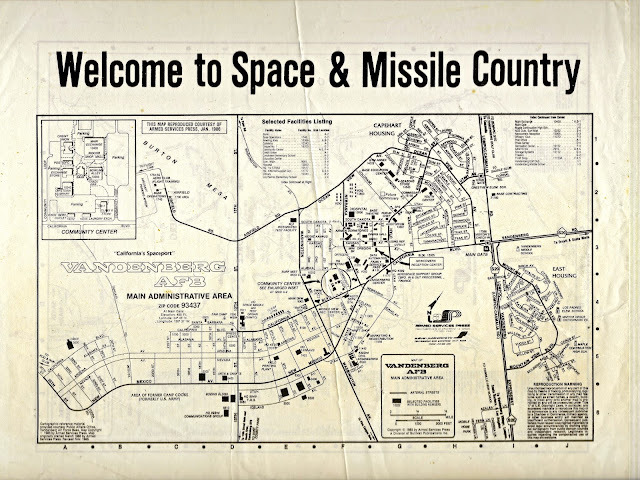 The collapse of the Soviet Union, target audience for all that might and deterrence prompted a reordering of the U.S. Air Force command structure and, in 1992, SAC was dissolved. Vandenberg remains, now primarily used for military space launches. Barred from admission that July day, Chris and I took our handout map (I'm guessing we weren't the only ones to get them), took a few snapshots at the gate and went on our way. Now, perhaps, its time to go back. Apparently they have a tour. In the Summer of 1987, soon after graduating from college, me and my buddy Chris took a baseball tour of California. Mostly baseball at least, and hell of a good time. This is the third part of a series inspired by those 16 days on the road.